High school counselors: We know it can be overwhelming to keep track of all the dates, deadlines, and requirements for admissions and scholarships processes. The IU Office of Scholarships wants to provide you with everything you need to give the best guidance to your students as they seek to join the family of Hoosier Scholars. We welcome thousands of amazing students to Indiana University each fall, and we couldn’t do it without your hard work and support. Thank you! Application for admission to Indiana University opens. Free Application for Federal Student Aid (FAFSA) becomes available. Encourage students to submit their FAFSA as soon as they can. 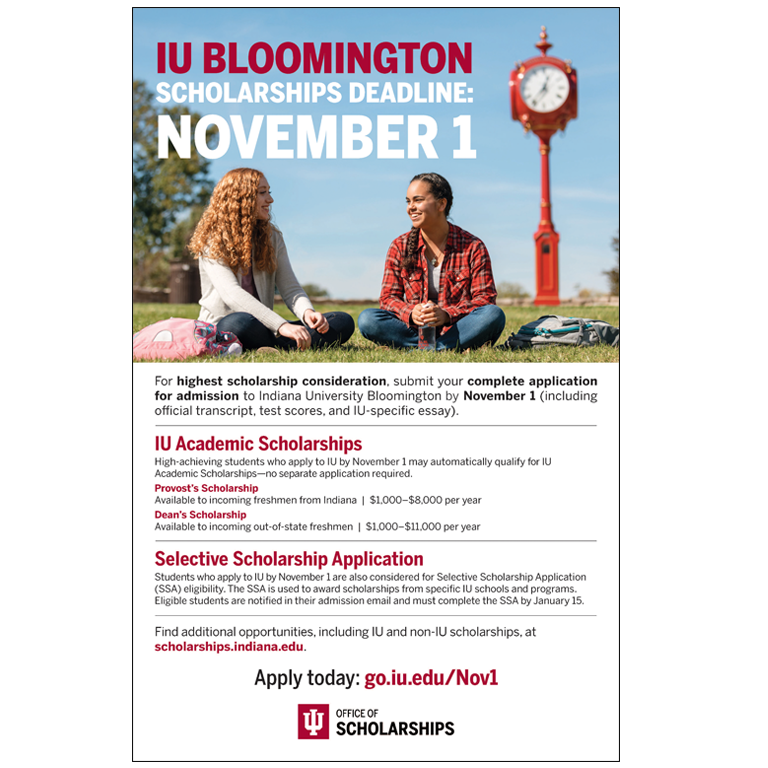 Early action (non-binding) and IU Academic Scholarship deadline. Students who submit a complete application for admission by this date will receive highest consideration for IU Academic Scholarships. Admitted high school seniors who complete the Selective Scholarship Application (SSA) must submit recommendation letters. Students request those letters during the process of completing the SSA. To ensure that their request reaches you, please ask your IT representative to whitelist all email extensions ending in the following: @indiana.edu, @iu.edu, and @academicworks.com. If your high school senior indicates that they have submitted the SSA, and you have not received notification from Indiana University, please contact the Office of Scholarships at iussa@indiana.edu. Office of Scholarships staff are pleased to attend your school’s Senior Awards Night or other ceremonies where IU Scholarships are announced! Please contact us to learn more.